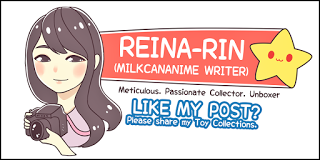 It took me quite a while to finally get my tools ready to review Katsuki Yuri. 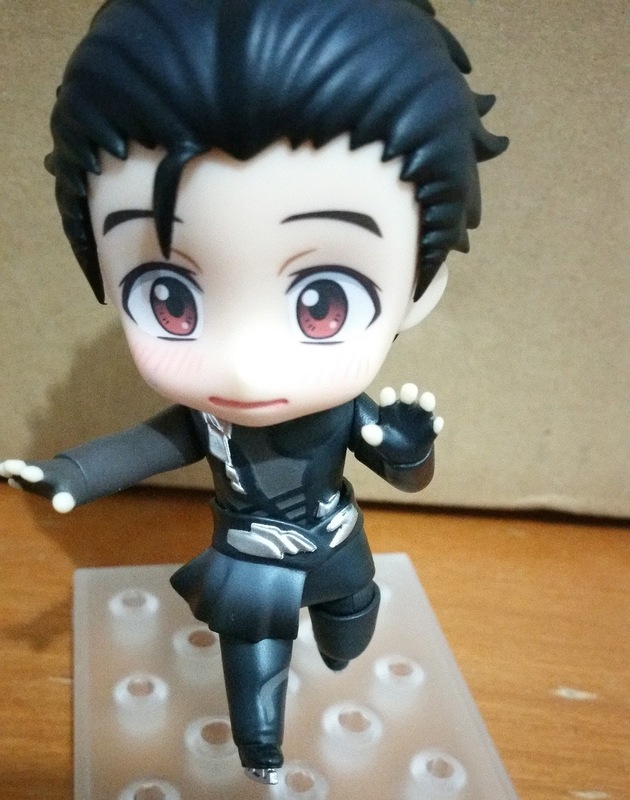 This is his first Nendoroid (not the event exclusive) and I also have Viktor on hand, and I will review him a little later. As you can see, most of Yuri's Nendoroid is clad in black, so having this white box with blue is a really good change. His box might look plain but it does come with tiny snowflakes to spice things up a little. These are usually hidden from view until light shines on them so be sure to orientate the box around to see them! 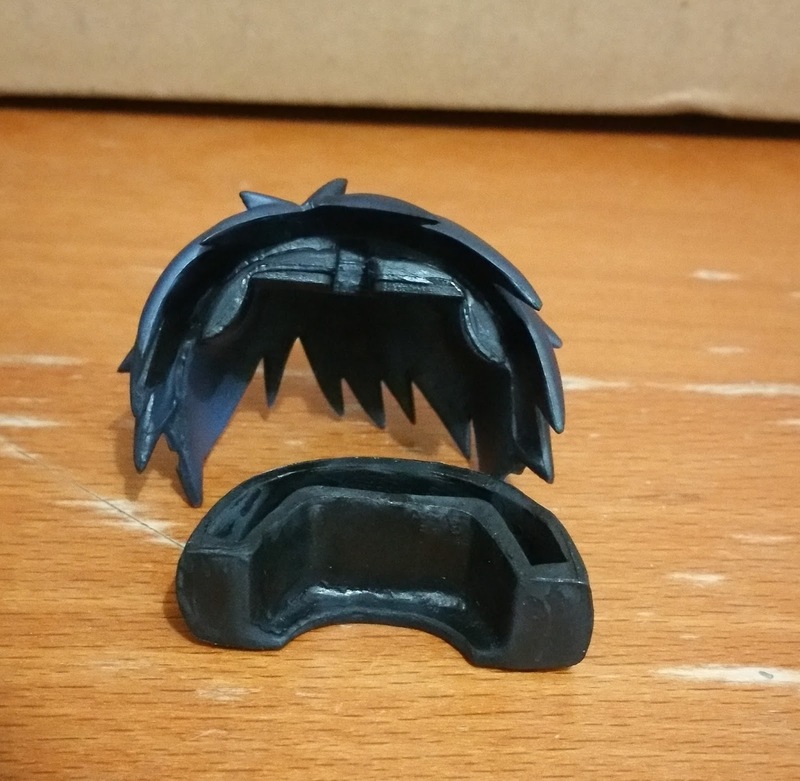 Something that I really like is how GSC has been handling the packaging for their smaller parts recently. 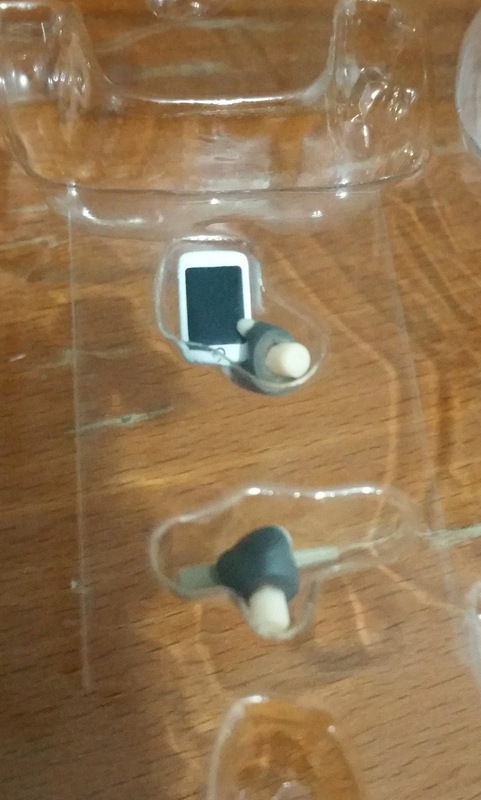 They have this plastic sheet on top of them that prevents them from spilling out when you open the box. 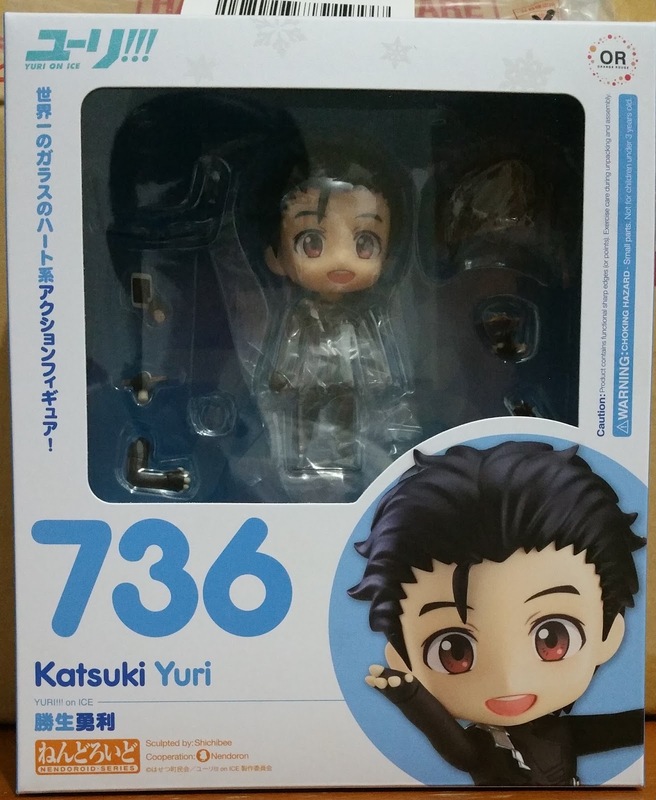 While this has been present for some nendoroids previously, I find that they are more common recently. First, let me get this out there. I am not very impressed with this Nendoroid due to how plain the colors are (typically black and silver) but there are a lot of details on this Nendoroid and I hope that this review would help to get more people to appreciate him better. Firstly, the part of his attire at his hip area has a little leeway for moving and manipulating. 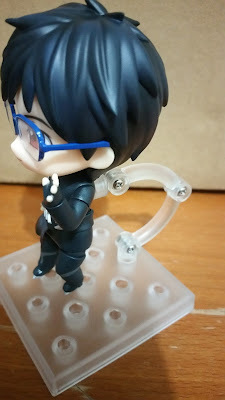 While it isn't removable (I think), it is certainly very flexible. 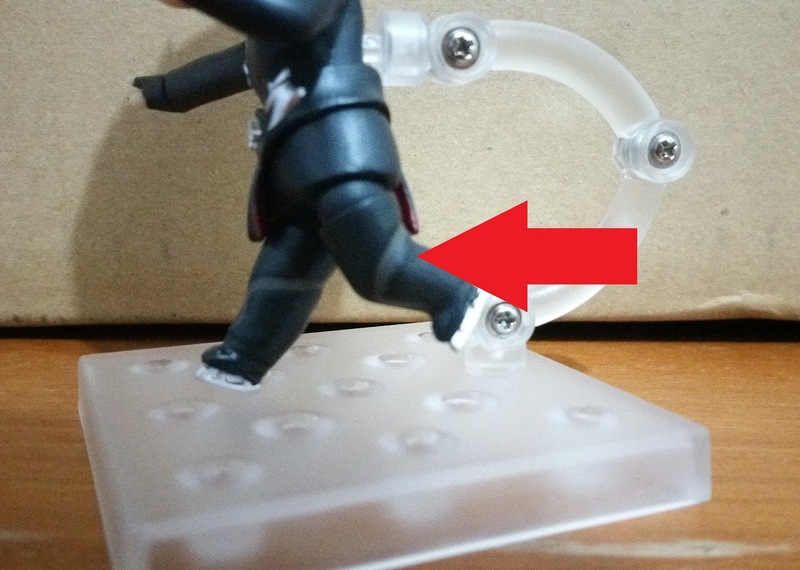 This helps to reduce damage from handling as well as allow more changes during posing. Here I tried a pose where Yuri is falling down. I don't think it worked out at all but at least that gives us a ton of uncluttered space to view his attire. Firstly, let's look at the details on his outfit. 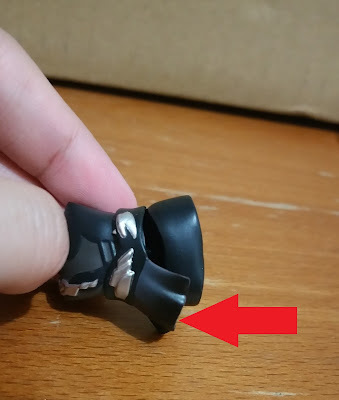 Although there is limited shading (due to the flat color of black), it comes with a few shades from black to grey to silver (white), which helps to add some details to the figure. It is also rather accurate to the attire in the anime, which is an area that GSC excels at anyway! 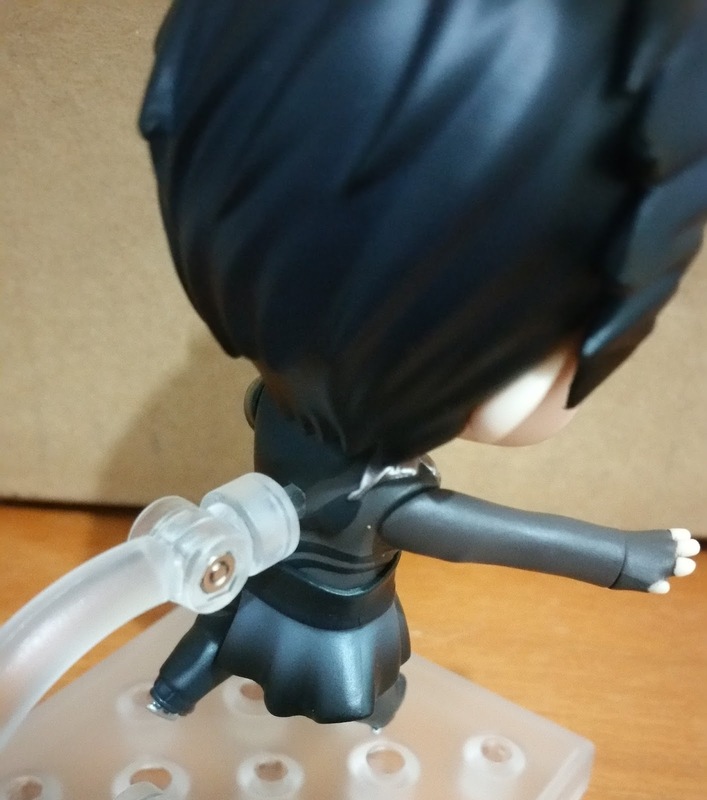 The sheet around his waist (the one that's flexible) has a gradient going from white to black. It's pretty and a nice detail to many others but I find the sharply-changing gradient a little jarring. 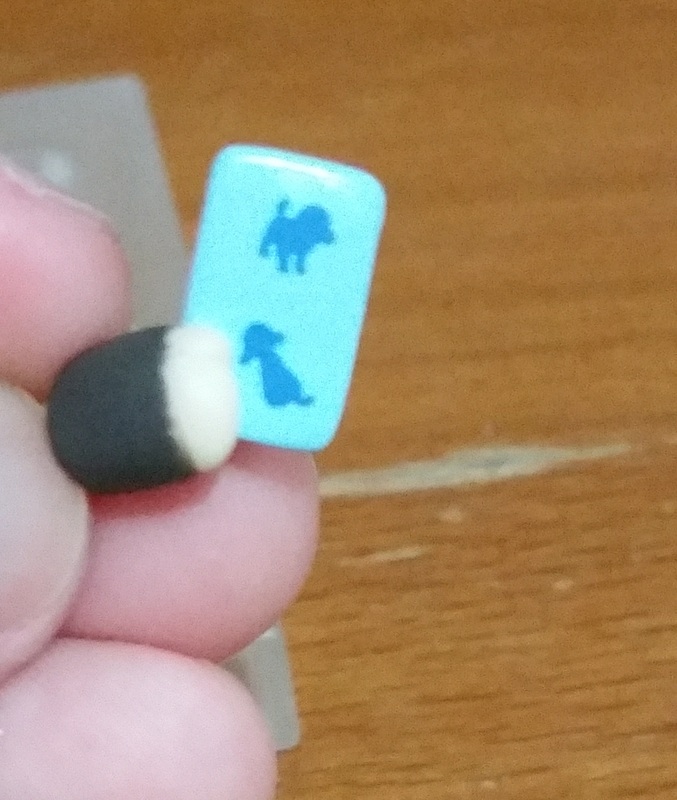 If it were a softer gradient, it would probably have looked much better on the eyes. There's a lot of details that's sculpted into the sculpt, like the indent at his shin area, or the grey parts around his chest area. 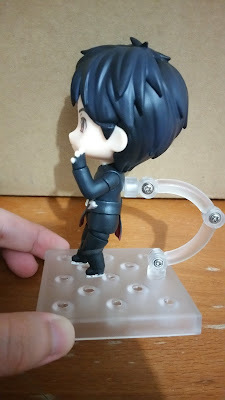 The silver parts at his waist are sculpted on as well, hence they look like they are layered on one another (which they are!). One part that I really like about this Nendoroid is the hair part, especially the additional hair part, which has his bangs down. It came with this additional black piece (image above) that attaches to the pegs on his front hair part. This helps to protect the pegs during transport. 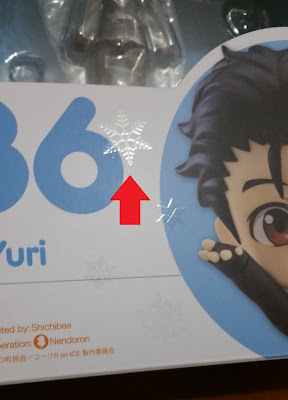 Well done, GSC! 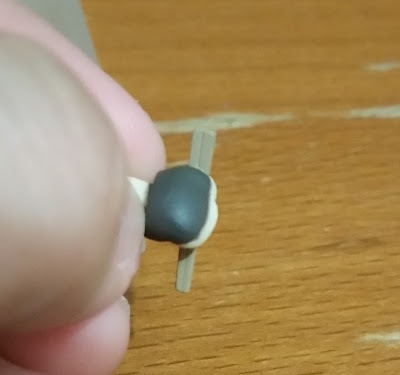 It helps to hide the hair seam so well! 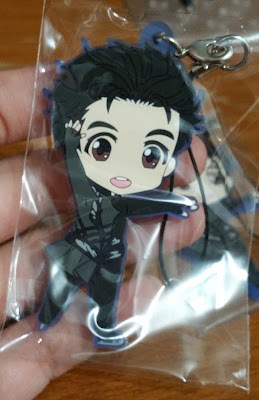 Why can't GSC employ this for the other Nendoroids as well? 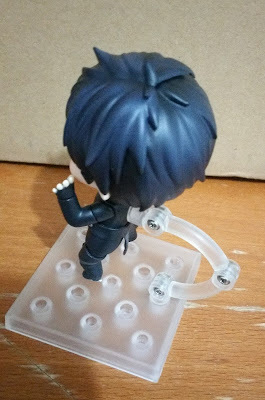 This could become the start of a Nendoroid revolution! 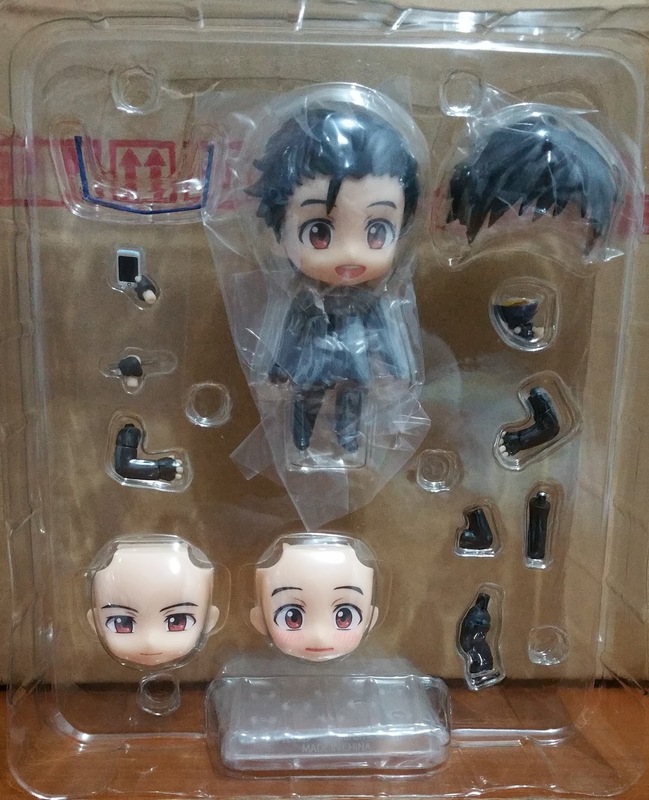 I love how the 2 different hair parts give such a different feel. 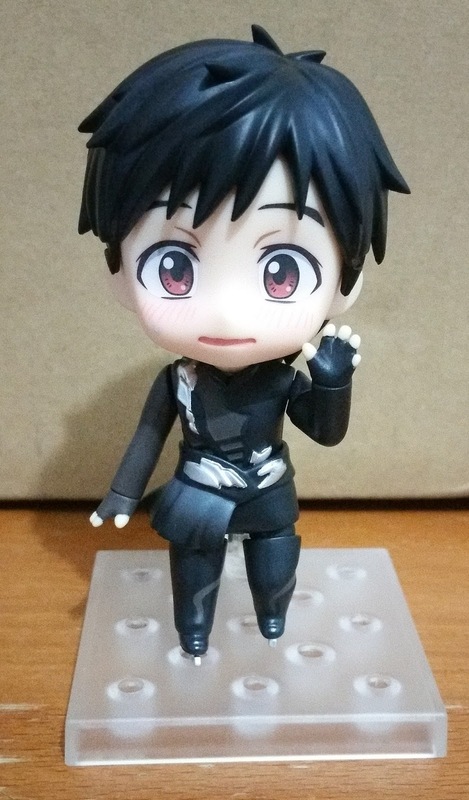 However I do find it a little strange to pose Yuri in his non-competition hairstyle when he is in this outfit. Well, but I could always think of it as him before getting his hair gelled and waxed... I guess? Next up, it's obviously his glasses part. It attaches to his front hair part through this sculpted dent at the sides of his front hair part. 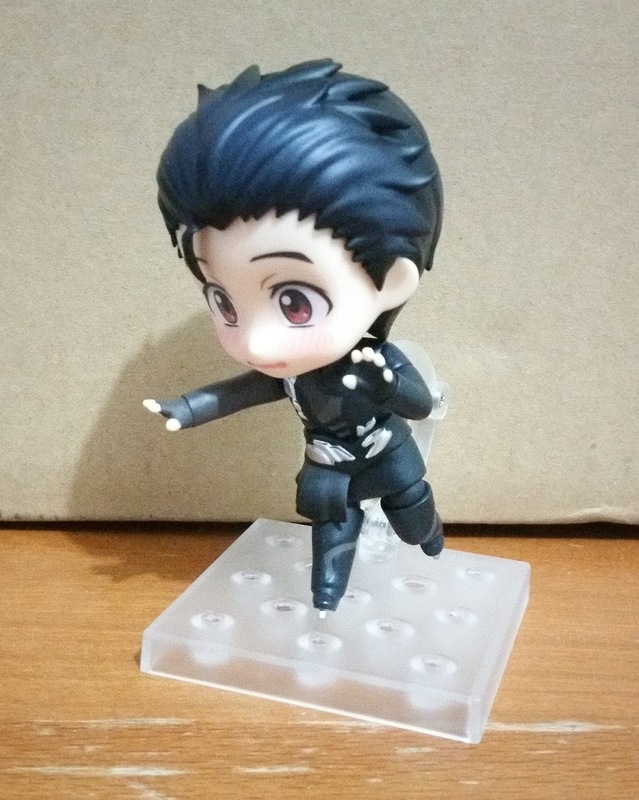 So you won't be able to use this with his other hairstyle. But you will still be able to use it with other Nendoroids though it will look a little more strained since other Nendoroids will not have this sculpted dent. 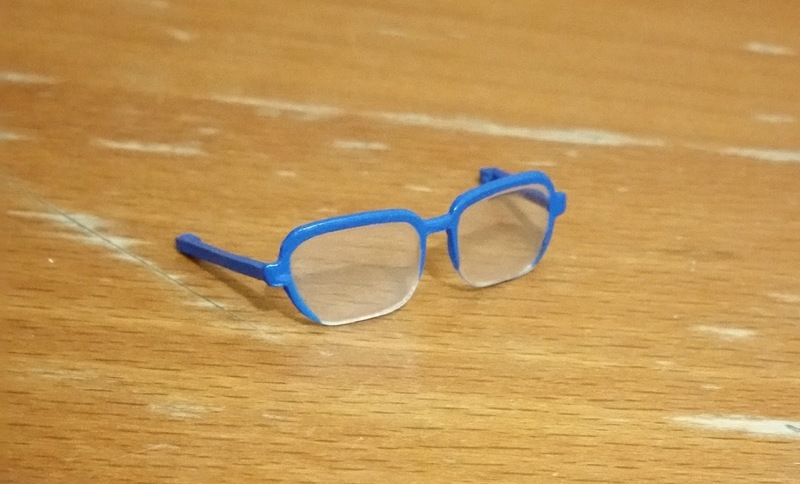 Note that glasses parts on other Nendoroids typically attaches inside the front hair part. With the glasses attached, Yuri is now all ready. You can see how snugly everything fits together and how nice and clear that navy blue glasses are, contrasting his black hair. 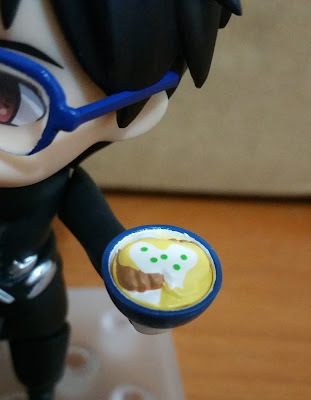 And last but not the least, let's look at his katsudon part. 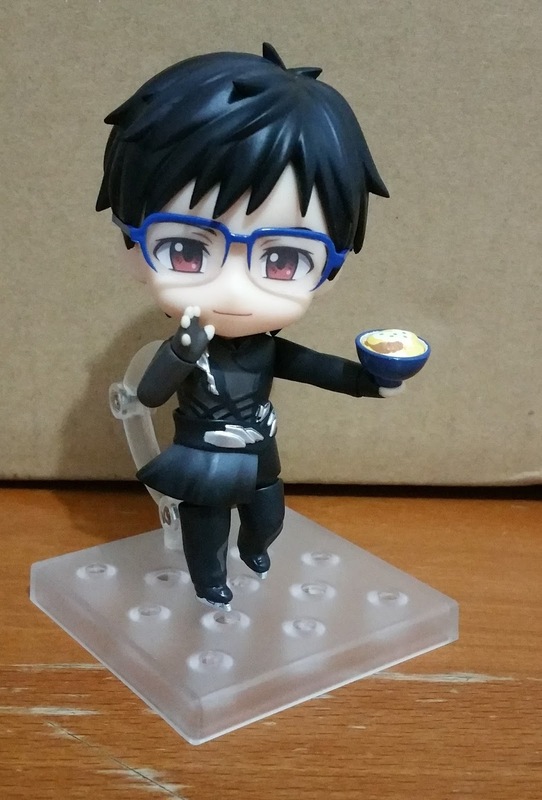 Katsudon is an integral part of Yuri and it was featured many times in the anime, and even had a picture of its own on Kahotan's blog. Now that I have it in front of me, I'll say that it looks quite similar to the prototype featured on Kahotan's blog itself! 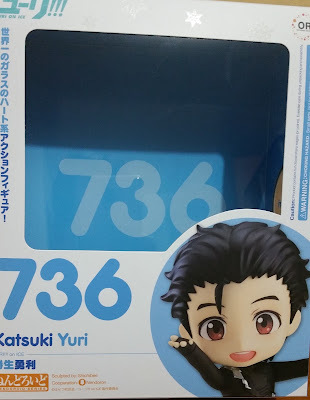 His smartphone part is one that I will not feature the Nendoroid using, but I'll like to point out that even the details on the phone cover were accurately painted (or printed) on. And since this is a GSC exclusive, here's the rubber strap too! No Comment to " Nendoroid Katsuki Yuri "